Abu Dhabi: High oil prices accompanied with rise in oil output are keys for GCC economic growth and a means to avoid any effects of the Eurozone on their economies, experts told the Gulf News on Sunday. “The UAE’s oil economy represented by Abu Dhabi is growing and the non-oil economy represented by Dubai is also growing in parallel, leading to the growth in its GDP,” Philippe Dauba-Pantanacce, senior economist, Turkey Middle East and North Africa Global Markets, at Standard Chartered Bank, said..
“The UAE, particularly Dubai, has benefited from the instability in the region due to the so-called Arab Spring which helped the Dubai economy come back to the period before the 2008 financial crisis amidst indicators that its real estate sector is recovering and on the ramp-up,” said Dauba-Pantanacee who is taking part in the conference on Future of GCC’s Competitiveness organised by Insead. Dauba-Pantanacce said that 2012 is a very good year for the GCC countries, particularly the UAE. “Oil prices are so far resilient and there is also a growth in the output which means higher GDP growth for the GCC countries,” he added. The other factor that one can witness in last 18-24 months is the public spending which helped the markets.“Salaries increased in the GCC region, governments tried to react to the Arab Spring by stepping up their fiscal spending. Massive spending in the region to support people is positive on the short run,” remarked Dauba-Pantanacce. “Dubai has come back as a safe haven in a troubled region, reaping the benefits of building strong service and tourism sectors. More than 50 million passengers flew via Dubai International Airport last year and it is expected that more than 54 million passengers will fly via the airport by end of 2012,” said Mark Beer, chief executive and registrar at DIFC courts. 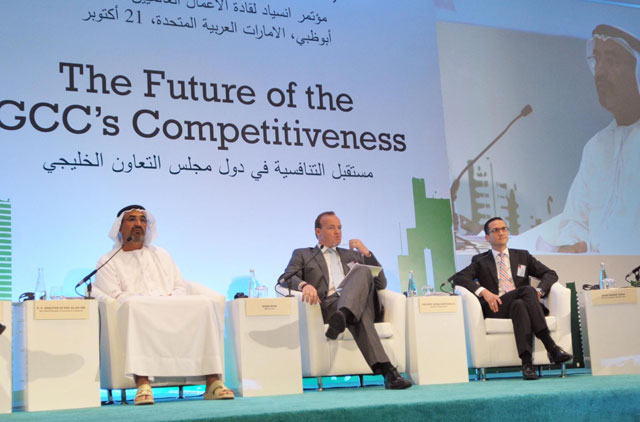 “The UAE private and public sectors are playing complementary roles to build the country’s economy. The country is a model for others; yet, the private sector should be given a major role to play as it is the sole sector that creates job opportunities in the future,” said Beer. Jean Marie Pean, chairman of Bain and Company Middle East, UAE, told the Gulf News that the UAE has so far succeeded in restructuring its economy and to avoid the bad consequences of the financial crisis in 2008 and the Euro Crisis. Khalfan Saeed Al Ka’abi, Abu Dhabi Chamber of Commerce and Industry (ADCCI) vice-chairman, said that the UAE is a business hub in the world that is suitable for entrepreneurs and businessmen to launch their businesses and ventures. “The UAE has uniqueness represented by its leadership which is committed to bring the country to be amongst the top 5 in the world. The UAE is the land of opportunities where more than 200 nationalities reside and work,” said Al Ka’abi. “In the UAE there are about 50,000 millionaires which is a sign that the country has distinctive business type and structure that is lucrative for foreign businessmen to invest in the UAE,” Al Ka’abi elaborated. “The UAE is a springboard towards regional countries’ markets and utilising the atmosphere of economic openness, the strategic geographical location, the sophisticated infrastructure and a competitive business environment,” he said.